There was a deep storm brewing out side my 5th story office window full of thundering and lightening when I got into work. Nothing out of the ordinary had happened. I caught up on some bills I had to play, and I basically relaxed until about 11:30 in the morning when knock sounded. As usual, my hopes for no cases for the day had gone sour, and in walked a smartly dressed silver Shoyru. He wore a black tux and looked like he worked for 00 Hog or someone of the sort. "Mr. Dark Night I presume?" he questioned, adjusting his black tie. "Mr. Night I work for the NSS," he began. "The WHAT?" I questioned, raising an eyebrow. "Neopia Secret Service. I'm head of operations, you can call me Jim Silver," the Shoyru continued. "What do YOU want?" I sighed. "As you might have heard, a top security villain escaped our threshold last night." "Exactly. Normally we would do this ourselves, but I believe this is more..." Silver paused trying to find the right words ," Your type of work." "Gimme details," I snapped, sipping a thing of brandy butter. "He escaped at approximately 6 AM NST and was heading toward the undisclosed location of Kougra La," Silver said quickly. "Kougra La eh? I know where that is. Continue." "He's in good alliances with many villains, so this could spell disaster for all of Neopia. We need you to work quickly, for Neopia's sake." "Why is it I always get stuck saving the world?" I groaned. "I'll take the darn case." "Brilliant! Best of luck to you!" Silver grinned and walked out the door. "Come on Blue," I sighed slipping my trench coat on. "We got work to do." I stood outside a large decayed building that looked as if it belonged at a Lost Desert bazaar. The shaggy sign above it read Kougra La. I looked at Blue and gave him a look that said "Shut up or you're lamb chops." And snuck over to the nearest window. Inside, there was a bar, and dozen of tables filled with every beast, creature, and villain in Neopia. I sighed, as I seemed to have no luck finding Mr. Billion, until I found him playing Cheat with Dr. Sloth, Mr. Shankly and Chet Flash. "Bingo," I whispered to myself and casually swaggered in the door. Blue had decided to go find Jim Silver, while I handled Kougra La. "So I say, hey you don't want no stinking dung, I'm gonna pelt you with it!" I overhead Shankly exclaim. "Darn straight," Chet nodded in agreement. "Two fours." "Dangit!" Chet muttered taking the deck back. "So Billion, why is it you called us here?" Dr. Sloth finally asked. "Gentlemen, you know of my motives. I ask of your assistance. And you will each be rewarded handsomely," Mr. Billion smirked. Suddenly the shadow Gelert turned his attention to the Neocola machine I was leaning against. "Who are you?" he grumbled. "Does it matter?" I snapped. "I know you. You're a gumshoe." "Why you eavesdropping on our conversation then?" "Then I got every reason to pound YOU to a pulp," Billion snapped. "You're gonna have to fight for it," I muttered drawing my cobrall dagger out of my coat. "Aw... isn't that sweet," Billion mocked. "The big bad detective thinks he can beat me up." The crowd at Kougra La sniggered. "I'm gonna try," I hissed as something knocked the door down. "MEEP!" I heard Blue exclaim as dozens of Shoyrus in black tuxes surrounded the place. "EVERYONE RUN!" Billion could be heard shouting as the gang of villains began to run from the Secret Service at a breakneck speed. They didn't catch anyone. Silver finally approached me. "Nice work Night," Silver grinned. "But I didn't arrest him!" I snapped. "We only wanted you to find him. Arresting him would be too great a danger." "Pay me," I growled as Silver plopped 10,000 Neopoints in my hand. "Good luck to you in the future," Silver grinned as I heard him mutter, "You'll need it." "Something tells me we'll be seeing him again soon," I sighed and walked back to my office. Note: Dark Night is not related to Tracer Bullet of Calvin and Hobbes fame. 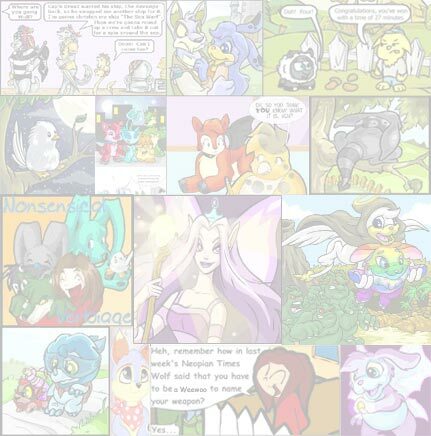 Neopian Times comics have been around since issue number 52 in the old edition of the NT. Of course, we're much more advanced now, aren't we? "I've got an idea." Megz strutted to the nearest Chia paperboy, who was giving out issues of the Neopian Times. "Excuse me!" 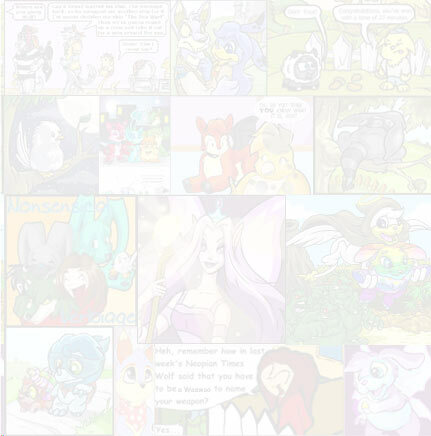 Most Neopets coveted the little faeries for the blessings they could give. To Antikia, they were just friends. "Come on, up on your feet. That wasn't too bad, don't be a child about it."